Cooking with fire – William Oatis, a U.S. Army Special Forces soldier, has been on a one-person mission to travel the world and figure out the best way to reintroduce Mankind to the dying craft of cooking with an open fire. Oatis, a native of Mississippi, was a Green Beret in 20th Special Forces Group of the Mississippi Army National Guard from the early 2000s to 2013. He currently is assigned to Special Operations Command South in a reserve billet. Oatis has spent the last five years traveling through over 70 countries on six continents researching the many different ways to cook. A lifetime hobby of cooking has led him to explore the art of outdoor cooking. He is now focused on traveling the world, researching the history of cooking, writing books, and designing tools to make live-fire cooking practical. Oatis is a graduate of the University of Southern Mississippi (1997) with a BA in History. He has had several vocations to include Green Beret (3 tours in Afghanistan), professional portrait photographer, book author, outdoor cook, and more. 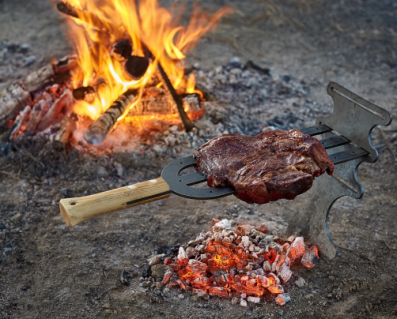 Listen to a one-hour long podcast where he talks about outdoor cooking and his research on cooking with live fire in William Oatis – Open Fire Cooking. The photo above is republished with permission of Asador.